1. Get the raw materials. The raw material for stars is really not very spectacular. All that is needed is gas and dust. That seems to be easy enough to find in our universe: Hydrogen and some other trace elements can be found in galaxies anywhere between stars. However, remember that stars are very big and heavy and you need lots of gas and dust to make a star. Particularly dense areas, sometimes called clouds of interstellar matter, are commonly found in the spiral arms of galaxies, which therefore see the highest rate of new stars. That's why the spiral arms of the Milky Way are a very good place to start if you look for the raw material to make a star. The Orion nebula is the brightest star nursery in our night sky and is located in the same spiral arm as is our solar system. Gas and dust must become more and more compact in order to form a star. There is only one force in the universe that can do that: gravity! Just as the Earth pulls you, apples, air, and everything else you see around yourself to itself, gas and dust particles attract each other. However, gravity is quite weak and it could never pull particles together which fly through space at high speeds. A new star can therefore only be born in regions which are initially very cold where particles do not move fast and are easily impressed by gravitational forces. Once gas and dust have started gathering closer together because of gravity, the gravitational pull is getting even stronger because now the distances between particles are smaller and gravita-tional forces between particles become stronger: The run-away collapse of the cloud of gas and dust has started. As gravity brings particles closer and closer together, particles start moving faster and faster. In other words: The cloud of gas and dust gets hotter. If the particles move fast enough, they will be able to escape from the cloud and will be lost for the making of a new star. In order to avoid losing raw material the cloud will have to find a way to cool off: particles need to get rid of some of the energy they gain from the gravitational collapse. They do this by giving off light. Accretion disk - computer simulation. Very small and light particles such as Hydrogen atoms are not very efficient at emitting light at these very low temperatures. Heavier elements such as Carbon, Nitrogen, or Oxygen and dust grains do a much better job at this and emit light in the far-infrared por-tion of the electromagnetic spectrum. To have at least a small portion of these heavier ele-ments around is therefore crucial to create a star. 4. A big rotating pancake. As the cloud of gas and dust gets denser, it will most likely start to spin because there may be more material going in one direction than the other. As this cloud of cold particles is spinning, some of the matter gets pushed out, like pizza dough gets flattened out when you spin it. Ejection of material from central region of an accretion disk. The cloud will start to become flat like a pancake, except with a big blob of matter in the center. 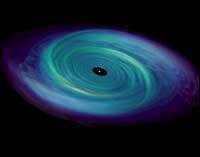 This rotating mega-pancake has a special name: astronomers call it an accretion disk. It does not emit a whole lot of visible light because it is a lot less hot than a fully-fledge star like our sun. However, astronomers can still get a glimpse of what’s happening because of the infrared light that the friction of particles in the big swirling pancake produces. As this spinning accretion disk keeps contracting, it spins faster, just like a figure skater spins faster when she pulls in legs and arms. Eventually, the accretion disk would spin so fast it would fly apart, if it did not lose some of that rotational energy somehow. The trick is to spurt material out the top and bottom of the accretion disk. This allows the accretion disk to continue to contract instead of falling apart. With some luck, the accretion disk contracts nicely while, at the same time, staying cool by radiating away light and reducing the rotational pull by spurting out matter to the top and bottom. 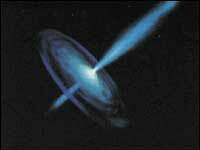 The accretion disk then contracts until its core becomes so dense and hot that the gases start to fuse. Hydrogen gas will fuse together to make heavier elements such deuterium and he-lium. This process is called nuclear fusion, and it is what makes a star a star. Fusion generates lots of heat and light, which is why the sun is so bright and hot that it can bring enough en-ergy to a far-away place such as the Earth to allow for intelligent life on it. That's how, eventually, a new star is born! A scientific simulation shows an even distribution of cold molecular matter collapse into filaments where stars are created in the denser regions. A fly-through of the later stages of the star cluster, showing the details of some of the star systems and proto-planetary discs.